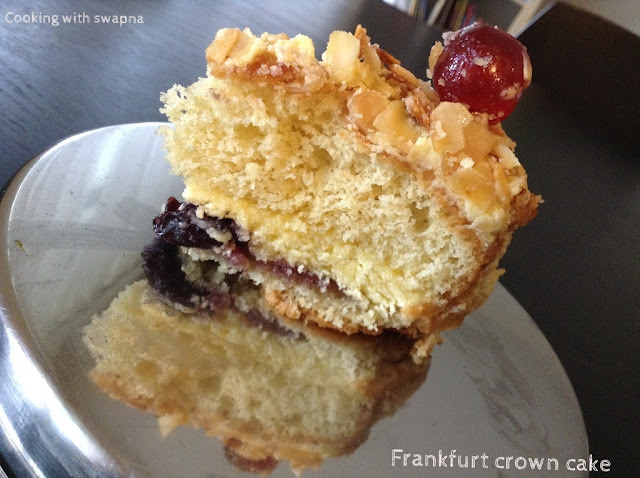 Cooking With Swapna: Frankfurt Crown Cake !!! 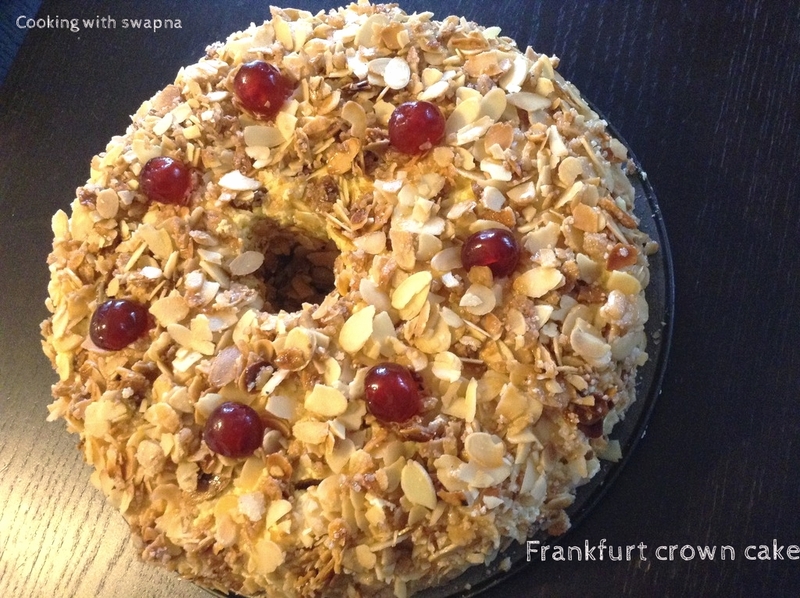 Frankfurt crown cake is very rich & most popular German cake. 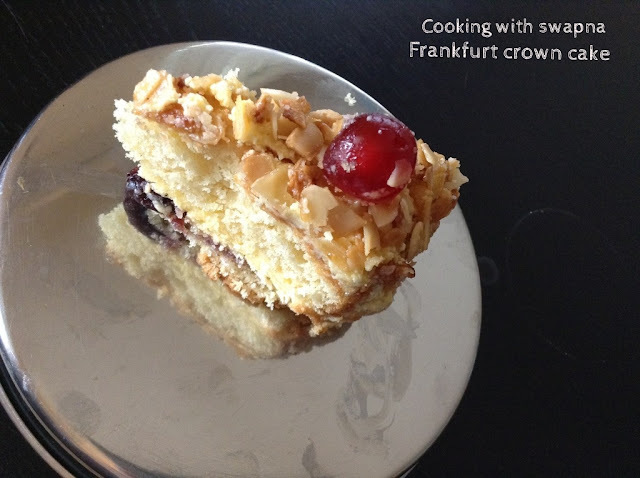 It symbolises a crown, with golden praline coated around the cake and jewel like cherries on top. Perfect celebration cake for all occasion !!! 1. Sieve together the flour, cornflour and baking powder. Keep aside. 2. Grease and line up the baking pan with parchment paper. Preheat the oven at 160 C.
3. Cream the butter and sugar. Add vanilla essence and lemon rind. Continue whipping. 4. Add in eggs, one at a time. Continue beating until thick. Gently fold the dry ingredients. Bake them for 25 - 30 mins or until done. 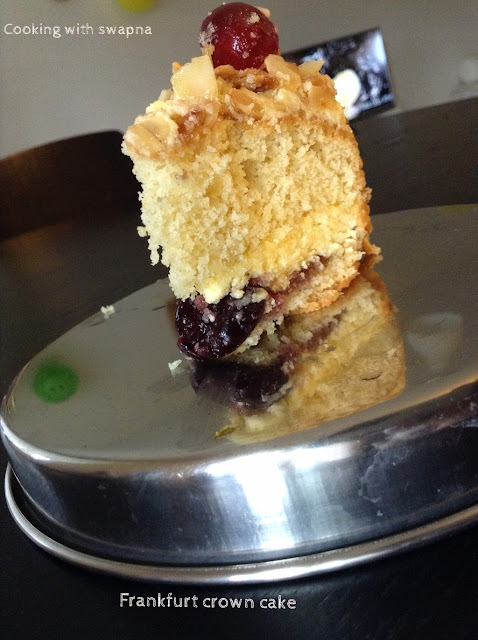 Allow it to cool completely & slice them 2 or 3 layers. 5. Prepare the vanilla pudding as instructed and allow them to cool completely in refrigerator. 6. Beat the butter until soft and light. Slowly incorporate the vanilla pudding into the butter mixture and keep beating by adding milk until thick & spreadable consistency. 7. Heat butter in the pan, add sliced almonds & sugar. Roast them for few mins until they are done. 8. Place the first layer of cake and spread cherry jam & spread the butter cream icing. Keep spreading the buttercream icing between the layers and over the cake. 9. 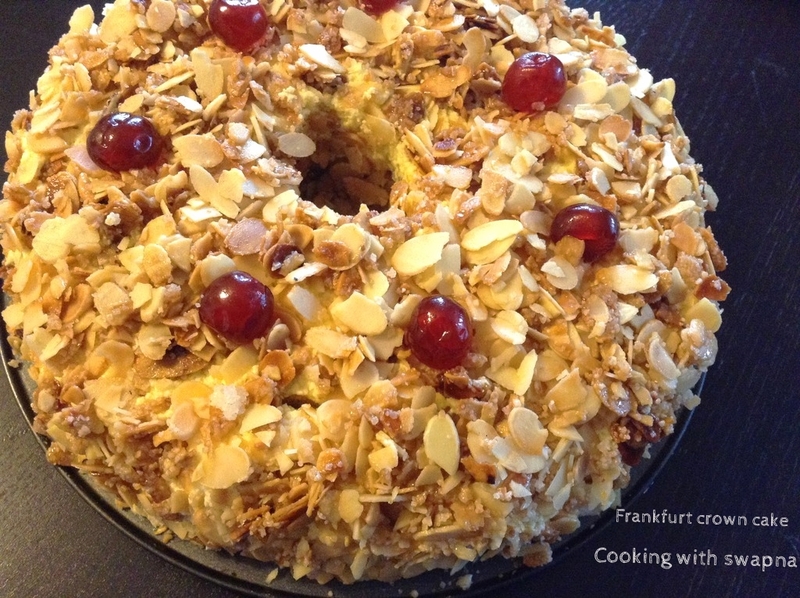 Finally sprinkle the almond praline over the cake. Decorate it with cherries and refrigerate.